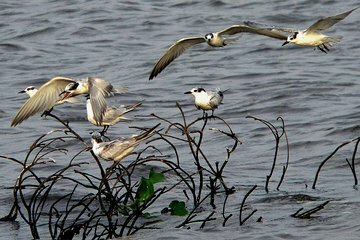 Go bird watching in the Muthurajawela Marshes, one of Sri Lanka’s richest wetland havens, on a private 4-hour trip from Colombo or Negombo. Enjoy a guided hike and boat trip around the biodiverse lagoons, marshes, and mangroves to watch for birds and other wildlife. Look for everything from kingfisher, heron, and curlew, to sea eagles, bittern, and marsh harriers, and enjoy a packed breakfast as you savor the natural surroundings. Hotel pickup and drop-off included. Depart your Colombo or Negombo hotel early and make the approximately 30-minute drive by private air-conditioned vehicle to Muthurajawela. Covering 14,826 acres (6,000 hectares) including the Negombo Lagoon, this coastal wetland habors rich birdlife, flora, and fauna. Historically, the area was prime rice-growing land. However, it’s thought canals built by the Dutch encouraged seawater ingress, leaving the fields unusable and turning them into tidal wetlands. The result is one of Sri Lanka’s 12 high-priority wetlands and a richly biodiverse home for 102 species of bird, plus 200 flora, 50 butterfly, and 74 species of reptiles, mammals, and fish. On arrival, enjoy three hours to explore with your guide, including hiking, a 2-hour lagoon boat ride, and a packed breakfast on route. Trek around the marshes and mangroves watching for birds like little green and black-crowned night heron, white-bellied sea eagles, shikras, and more, and identify them with your guide’s help. You may also see wildlife like water monitors, six-toed green frogs, and even the elusive fishing cat. Plus, during your lagoon cruise, look for other water birds such as kingfishers, Eurasian curlew, cormorant, whimbrel, greater-painted snipes, and more. Afterward, your trip concludes with a hotel drop-off.